Raquel Queirós is a staff researcher in the Water Quality Research Group – Life Sciences Department at the International Iberian Nanotechnology Laboratory. Her main research interests include label-free detection methods for life science applications, new biomimetic materials as molecular recognition probes and engineering solutions for water quality monitoring. Raquel Queirós holds a Diploma in Chemical Engineering (2007) and a Master in Technologies for Environmental Protection (2008) both from Instituto Superior de Engenharia do Porto (Portugal). She was a researcher at INESC TEC (former INESC Porto), where she worked on the development optical biosensors for different applications: water monitoring, food safety and control and health. She obtained her PhD in Physics from Universidade do Porto (Portugal) in 2013. 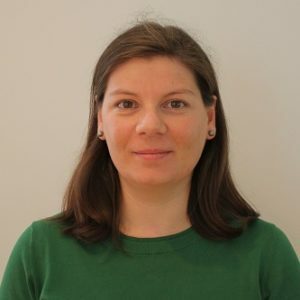 Raquel joined INL as a NanoTRAINforGrowth Marie Curie Research Fellow in 2014, where she started working on the development of new nanomaterial-based sensors for water biotoxins monitoring. Aptamer-based fiber sensor for thrombin detection. Evanescent wave DNA-aptamer biosensor based on long period gratings for the specific recognition of E. coli outer membrane proteins. Queirós, R.B. ; de-los-Santos-Álvarez, N.; Noronha, J.P.; Marques, P.V.S. ; Sales, M.G.F. (2013). A label-free DNA aptamer-based impedance biosensor for the detection of E. coli outer membrane proteins. Recycling old screen-printed electrodes with newly designed plastic antibodies on the wall of carbon nanotubes as sensory element for in situ detection of bacterial toxins in water. Determination of Microcystin-LR in waters in the subnanomolar range by sol-gel imprinted polymers on solid contact electrodes.